This is a brief post to catch you up on where we’ve been and what we’ve been doing. Enjoy more photos than paragraphs this time! 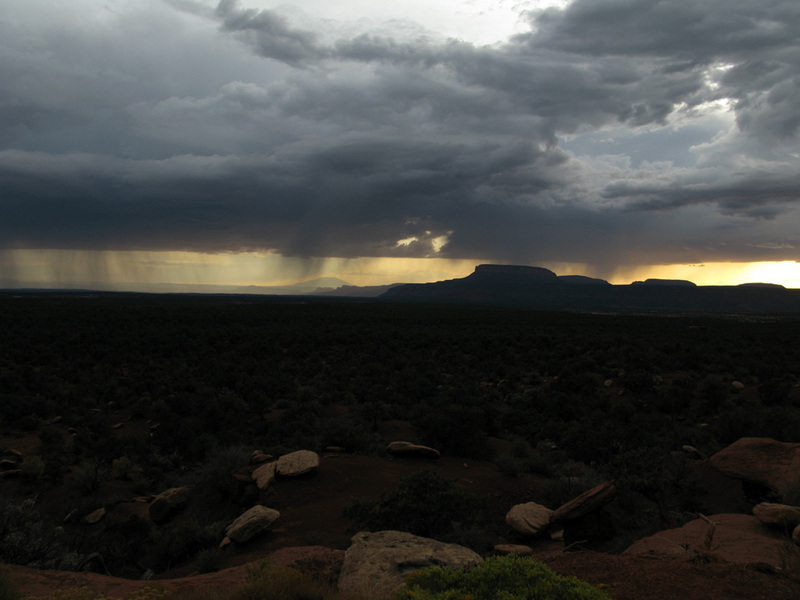 We arrived at Mesa Verde National Park in the southwest corner of Colorado just before a powerful thunderstorm ripped through the area. Lightning was striking all around while we waited it out inside the Jeep and enjoyed some dinner in our seats. The next morning we toured the park and booked a ranger led tour of the “Balcony House” ruins. This was considered the “Indiana Jones” tour as it involved climbing two ladders and some moderate hiking. The National Park Service really dumbs everything down, so when they say things like “a very strenuous 4 hour hike,” that means it will take us about two hours and we won’t break a sweat. Anyway, Mesa Verde is an awesome park full of cliff dwellings left over by the Anasazi Native Americans. We spent most of the day in the park exploring different areas then retired back to the park campground and hung out with our neighbors Katie and Will, a nice couple from Brooklyn who’ve been WWOOFing in California for a while. 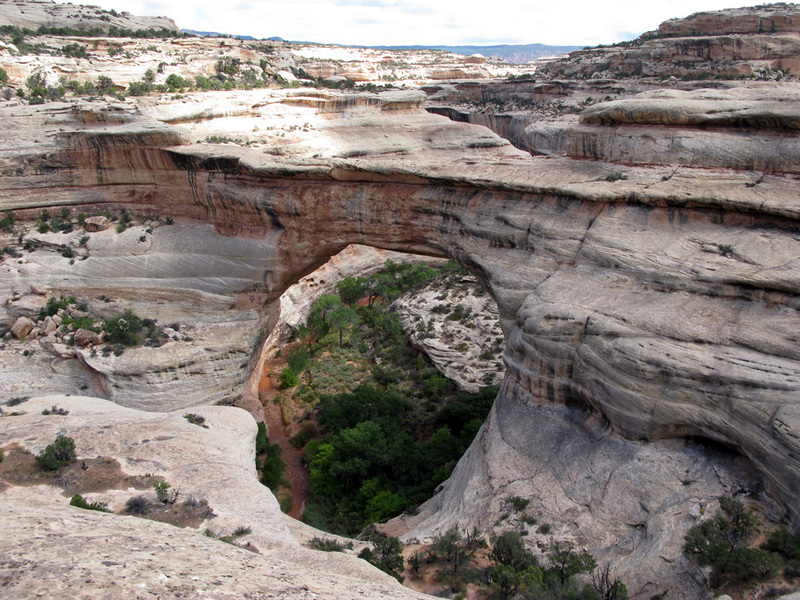 We departed Mesa Verde and Colorado for our next area of exploration, southeast Utah. Utah simply rocks. There is no place like it really; each day brings us to another natural wonder and usually another National Park. Our first stop was at the Hovenweep National Monument to tour some more cliff dwellings and ruins, really impressive structures all around the rim of a gorge. 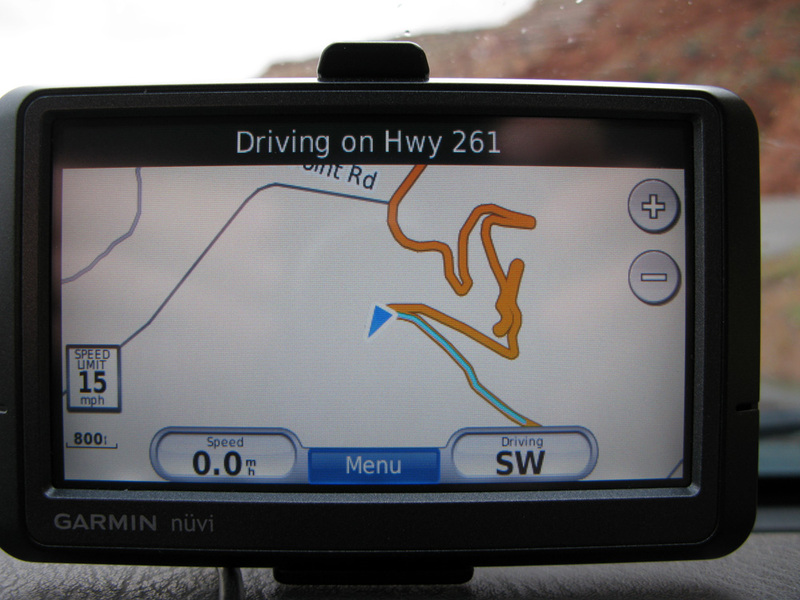 After Hovenweep we drove through the spectacular “Valley of the Gods” area. We had hoped to camp there for the night but high winds made us change our minds and move on. That night we found a free spot near the Natural Bridges National Monument. 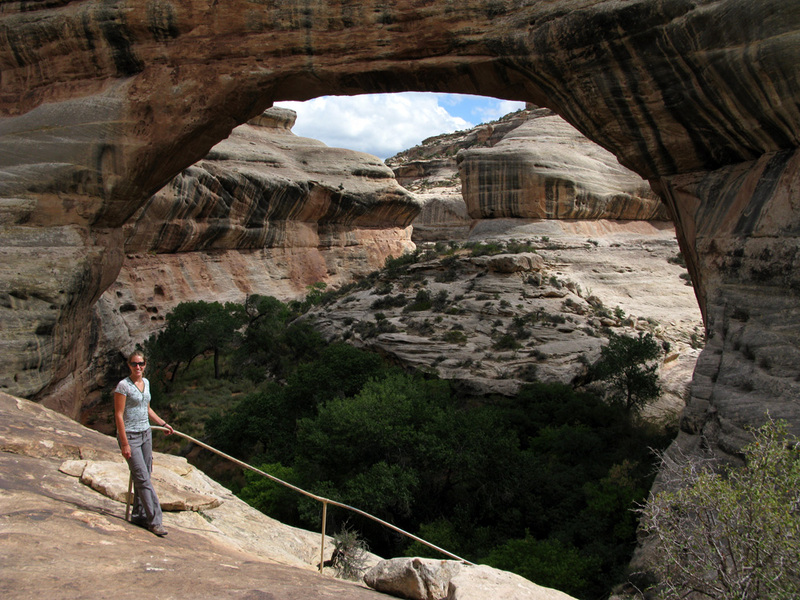 The next morning we hiked down to the largest bridge, Sipapu. 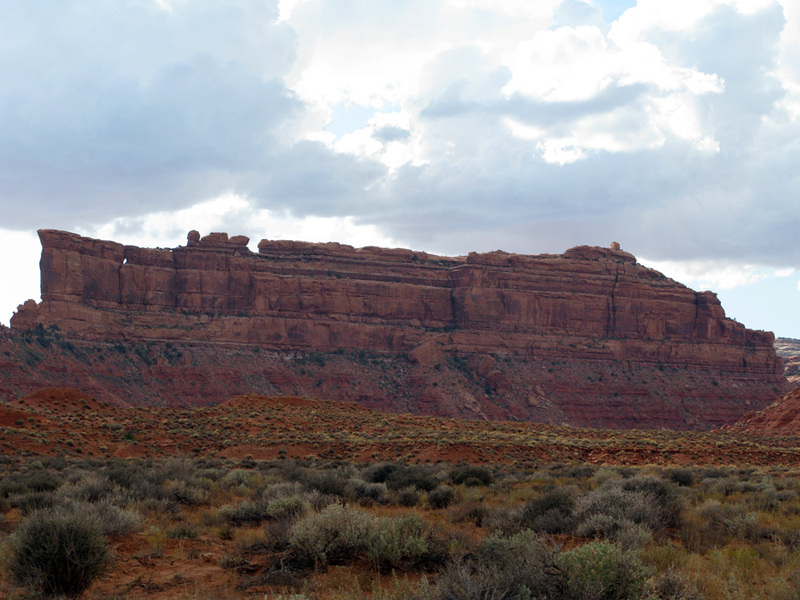 We needed to get to Moab, Utah by September 19th to meet up with our Green River canoe crew so we drove north to Canyonlands National Park – Needles district. We spent the night at the awesome Needles Outpost campground, which was on the park’s border and has showers! 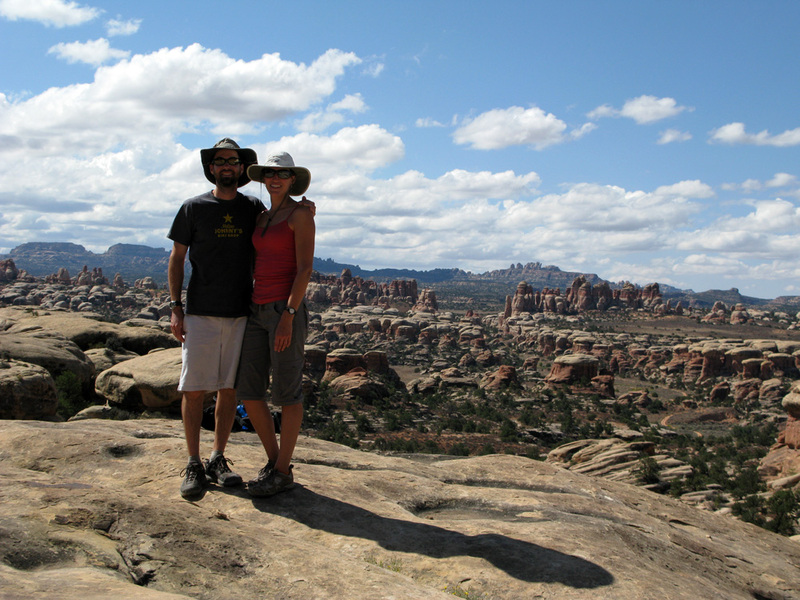 It had been a few days… The next day we went for a really long desert hike on the Chesler Park trail around Canyonlands. This 12 mile loop went past the awesome needle-like rock formations (thus the Needles district) and through narrow slot canyons. We were exhausted from the terrain and heat, but enjoyed the hike thoroughly. We had only a short drive to Moab that afternoon and gorged ourselves at the delicious Pasta Jays restaurant once we arrived, another fine recommendation from Todd and Ron whom we met in Telluride. We ate a ton and relaxed that evening at a campground in town that was super packed full of Jeepers and mountain bikers. 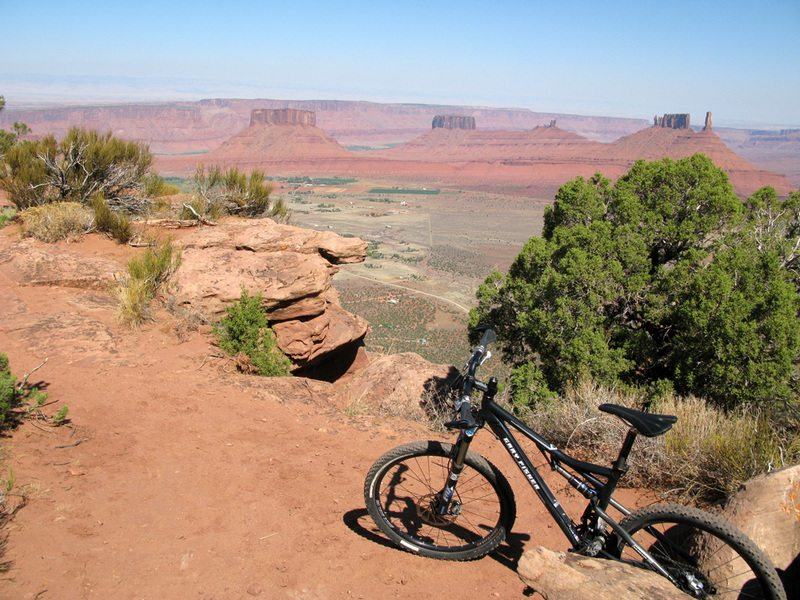 Moab is our kind of town! 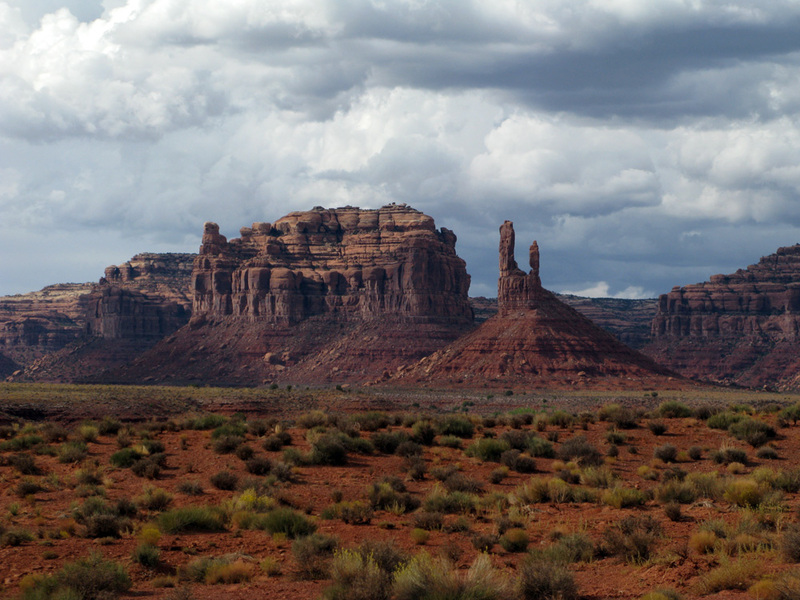 It’s nestled in a valley surrounded by red rock and Arches National Park. It’s on the bank of the Colorado River, so there are lush cottonwood trees all around town giving it a nice green glow. A tourist town for sure, the main draws are mountain biking, river running and four wheel drive tours. There are some really good restaurants too. The next morning while Caro relaxed at a coffee shop and worked on the blog, I went for a ride on what could be the most famous mountain bike trail in the world, Slickrock. It was a hot one but the trail was excellent, probably the most traction I’ve ever had on a bike. I could literally stand up and lean over the bars on the steep climbs and not lose grip. Good thing because the trail seemed to be all steep climbs! As I crested the top of one of those climbs, a group on a Hummer tour saw me make it and let out a big cheer – it was great! Completely beat, I picked up Caro and drove down the main drag in Moab to meet up with the canoe crew: Brent, Mandy, Brad and Steve. We stayed that night at the Ramada Inn, our first night in a hotel since the trip began! 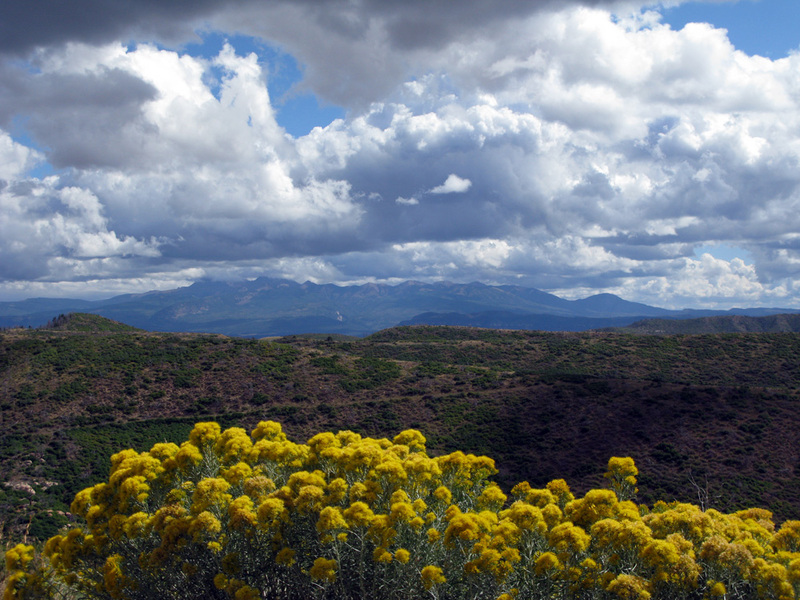 Beautiful flowers & beautiful views over Mesa Verde National Park, Colorado. 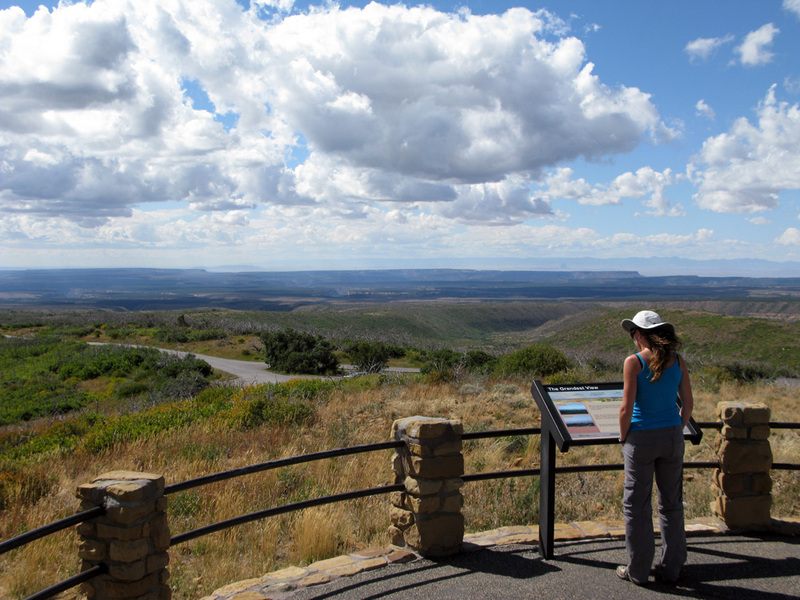 Great views from the high point at Mesa Verde. 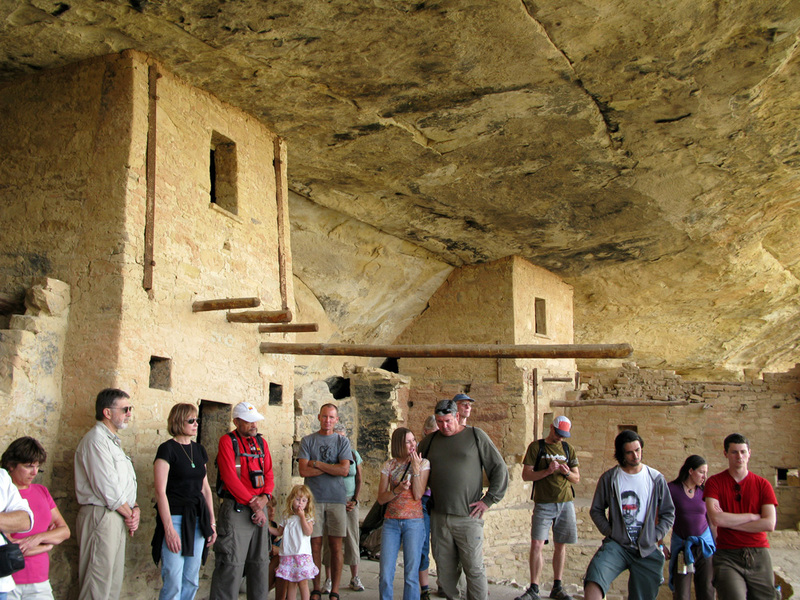 The awesome Balcony House at Mesa Verde. 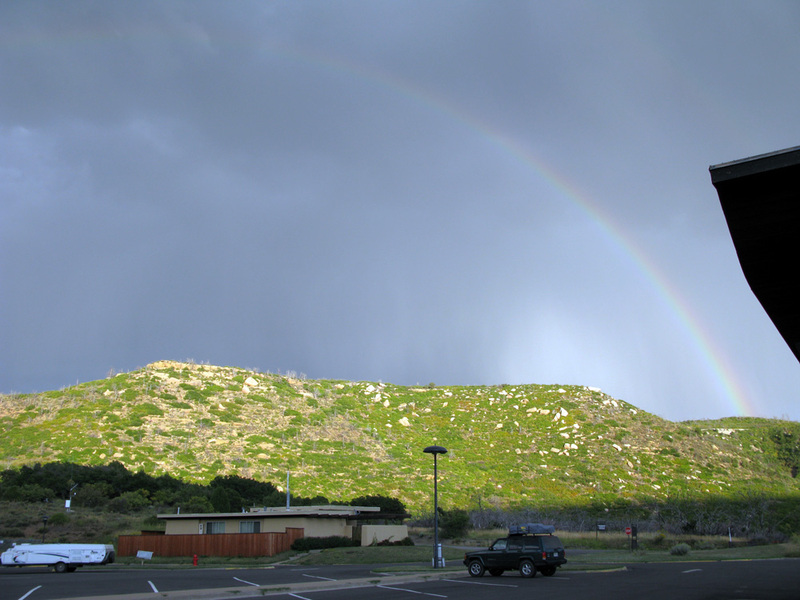 Rainbow over the campground at Mesa Verde, powerful thunderstorms the night before. 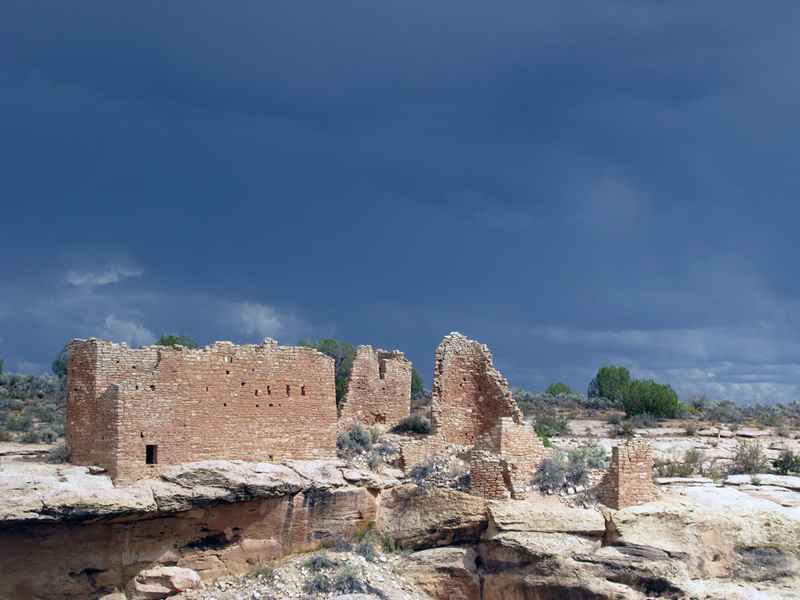 Hovenweep National Monument, our first stop in Utah. 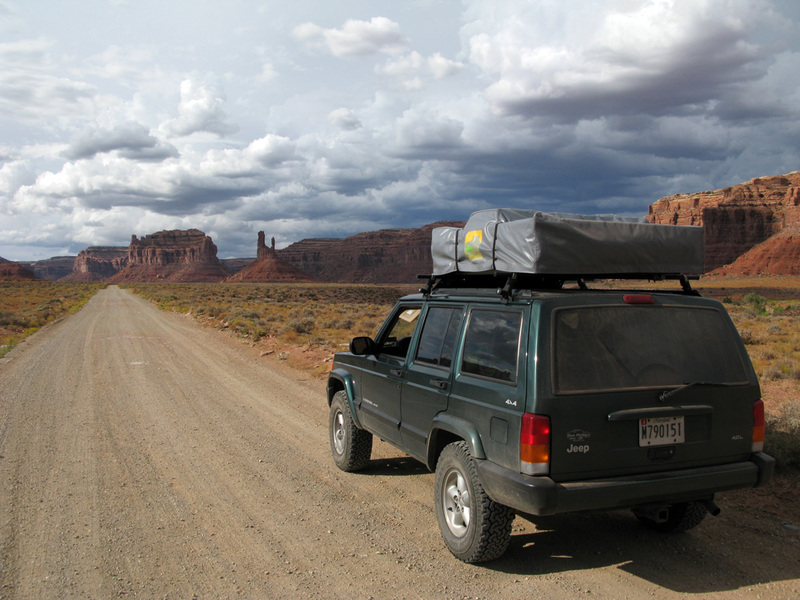 On the road in Valley of the Gods. The twisty rollercoaster road at Valley of the Gods. 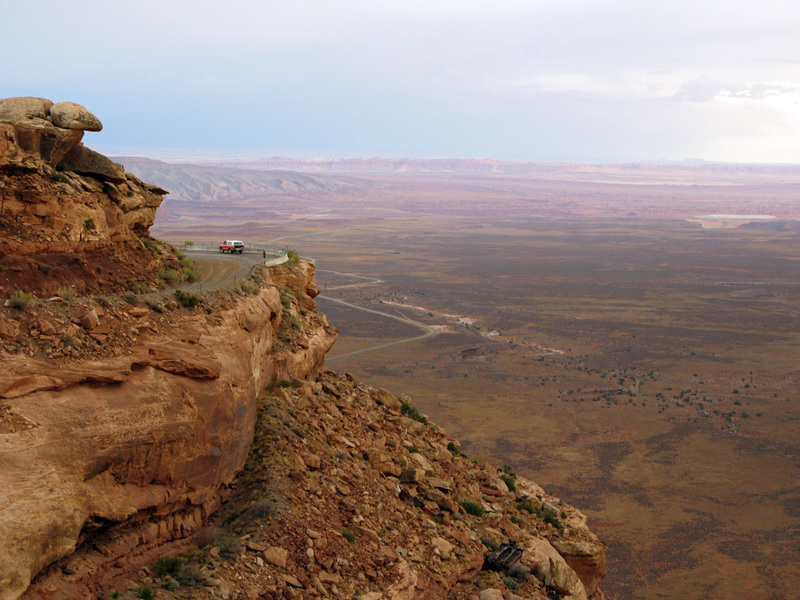 Up the final switchback on Utah 261. 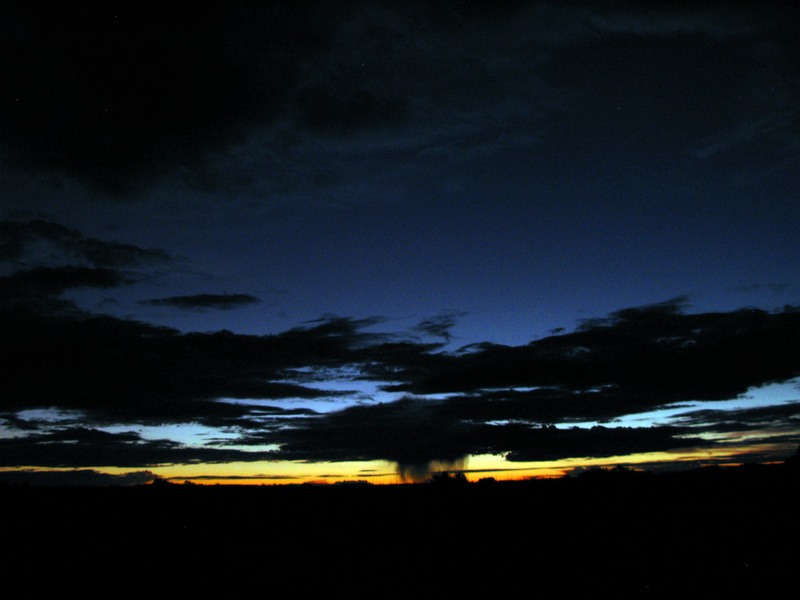 A western big sky with rain in the distance. 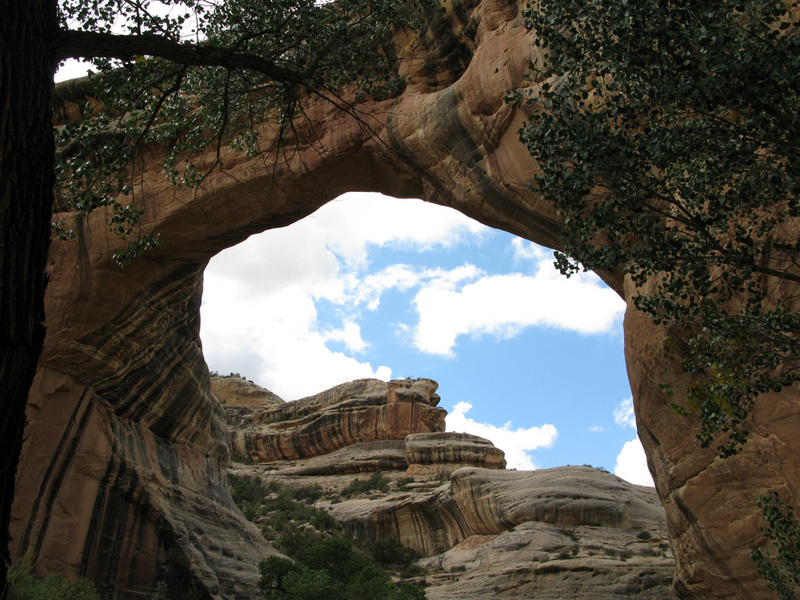 Natural Bridges National Monument - Sipapu Bridge. 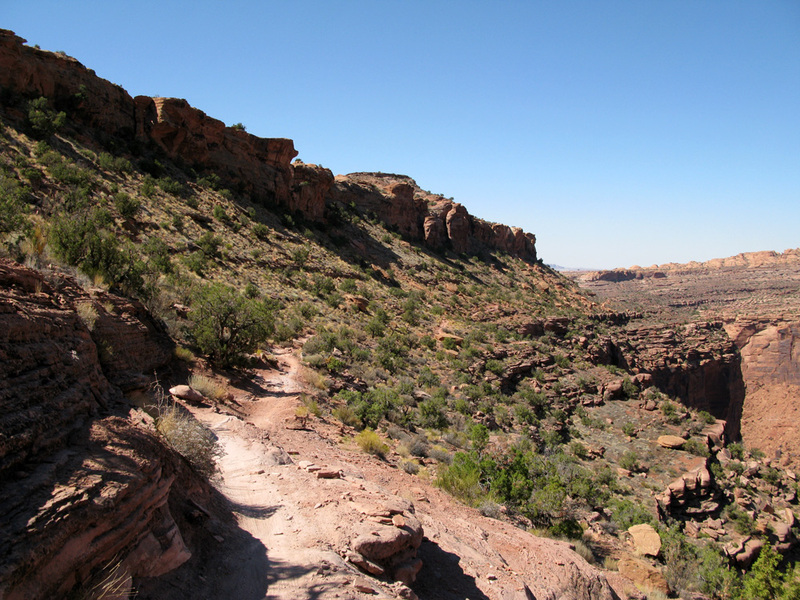 Hiking down to the Sipapu bridge. Looking up at the bridge, it's taller than the US capital building. 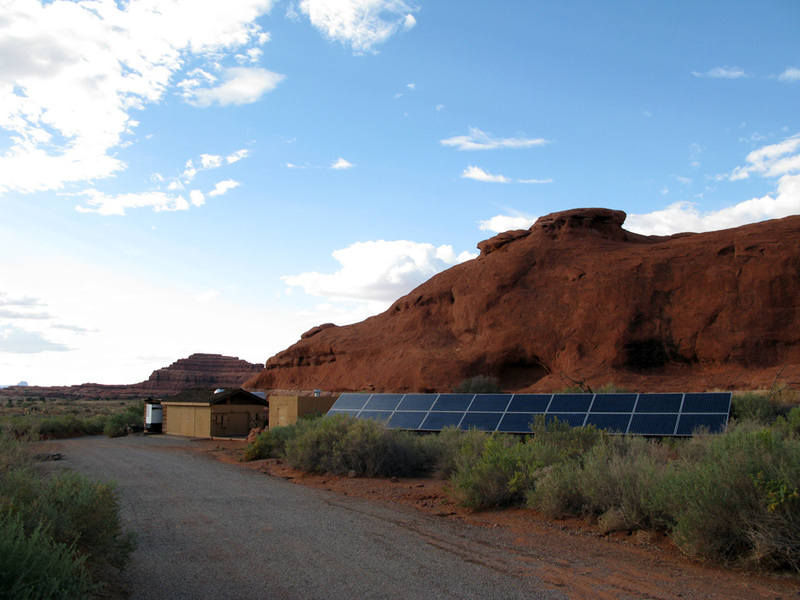 Solar power at the Needles Outpost campground. 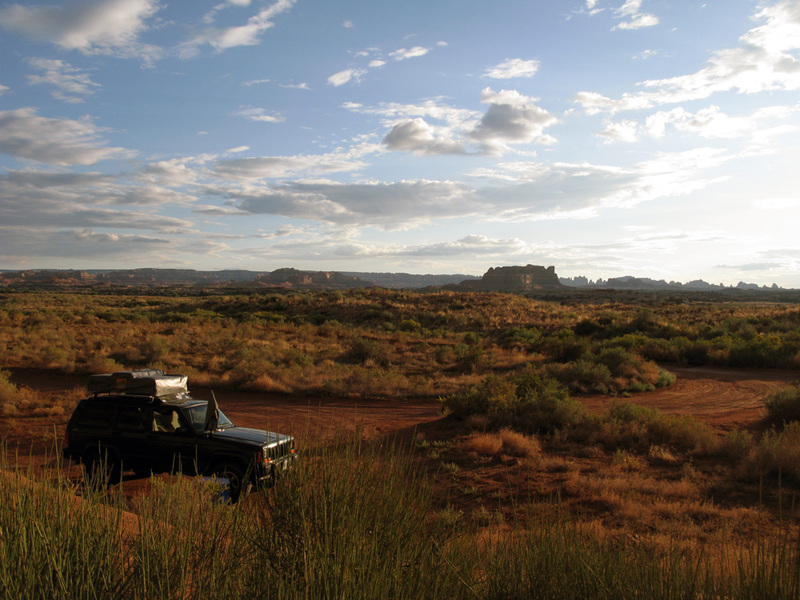 Another kickin' campsite at Canyonlands National Park - Needles district. 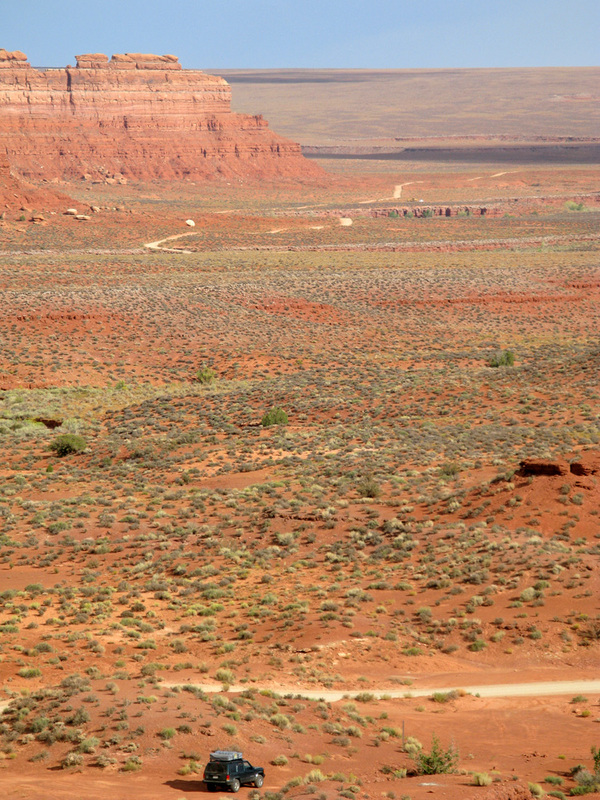 On the 12 mile hike in Canyonlands. 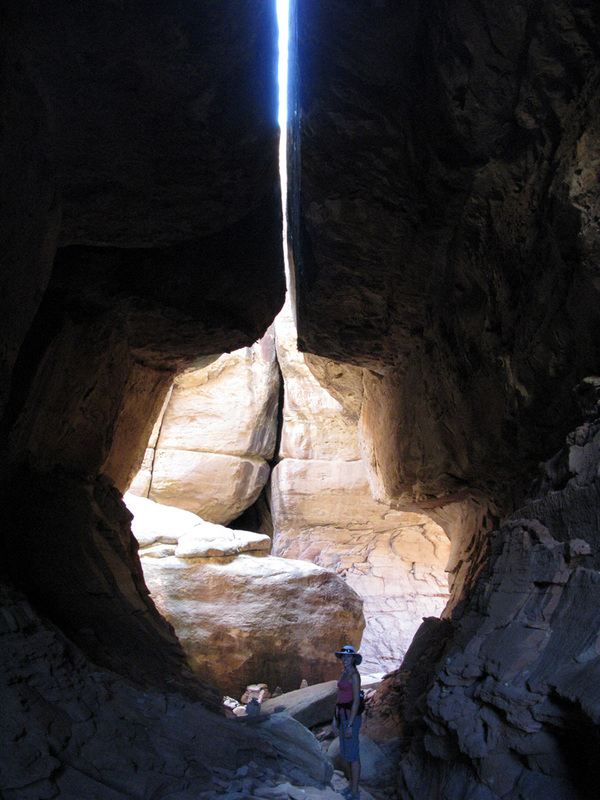 In the slot canyons of the Chesler Park hike at Canyonlands. 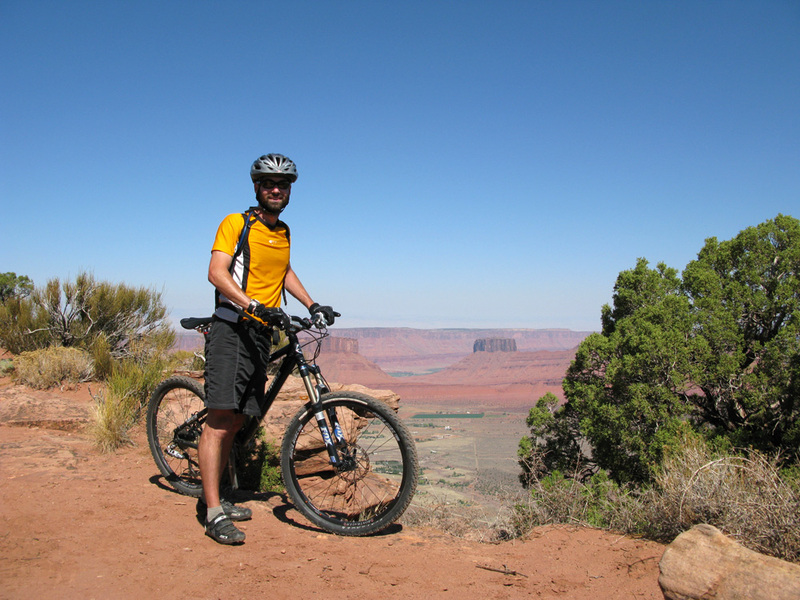 On the Porcupine Rim trail at Moab. 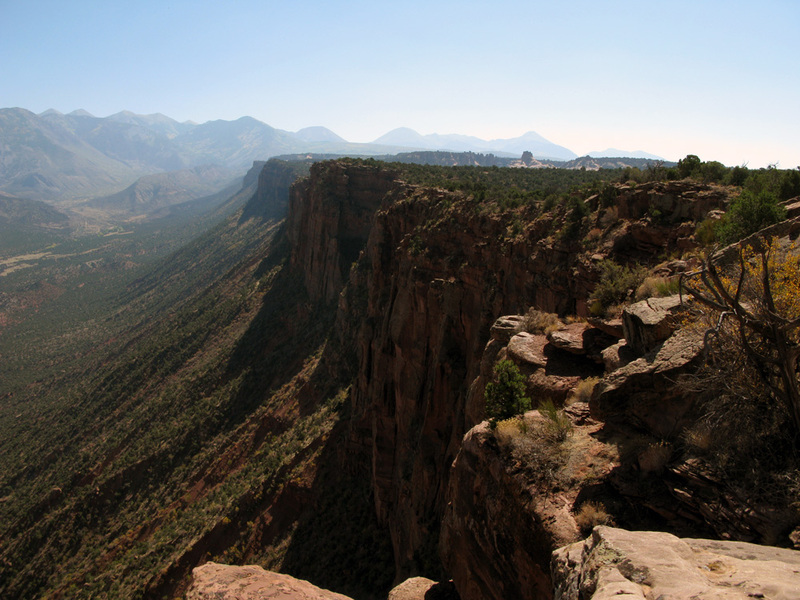 Porcupine Rim: 3 mile climb and 11 miles of downhill, doesn't get any better. The views from the rim were awesome! I love Moab. On the singletrack downhill back to town. A HOTEL, going soft? Back on the roof!